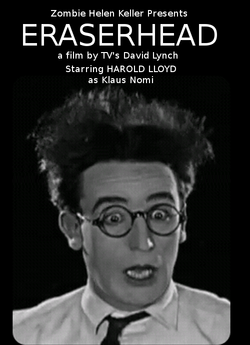 Eraserhead is a silent film starring Harold Lloyd as Klaus Nomi. It was the student film debut of popular talk show host, David Lynch. The surreal film was an instant hit with the third feature drive-in crowd, with a 20% retention rate. 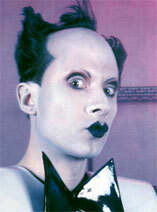 Lonely East Berlin Boy, Klaus Nomi has no friends. He spends his time redecorating the inside of his mother's range. Since she only serves him Beans and Franks, his fortress is never disturbed. As his pre-teen iron curtain angst develops into a need for speed, he starts racing. The family is supported only by the mother's job as a anesthetist at a backroom sexual reassignment chop shop. With the price of Beans and Franks, along with the occasional bag of Gummi Bears, she is barely able to afford a model race car. Fortunately Klaus has a sharp pencil and an active imagination. His mind, however races like his toys. As his race designs evolve in his head faster than he can committ them to paper, he becomes addicted to chubby pink pet erasers. His mother, unable to stand the rubber dust, persuades him to try chalks and slates. "Bigger erasers! ", she says. With the switch she begins to wish the chalk dust was more like the rubber dust. On bring your daughter to work day, mother plans to bring Santra, who up 'til now was not important enough to mention. At the last minute, sister Santra convinces Klaus to go in her stead, because something suddenly came up. Klaus agrees and goes to work with his mom. Without spoiling a major plot twist, a good time was not had by all, and Klaus was soon nicknamed eraserhead. Which accounts for his ability to hit high C.
Arnold Schwarzenegger starred in a noisy remake, with the stub titled, Eraser. His nickname still coming from his stub down in his lonely place. This time instead of an East Berlin punque, he is a CIA Operative that does a lot of loud stuff, making this perfect for the hearing audience, ignored by the original. Zombie Hellen Keller, originally hated the idea of the remake, but after a private screening, she took out full page ads proclaiming "Arnold is my Klaus'. The Klaus Nomi story, Eraserhead, was reworked into a sitcom aired on MTV as Beevis & Butthead, Kick the Crap out of some Foreigner and lasted for 15 seasons, unlike music videos. Casey Kasem starred in a XM Satellite Night at the Movies version of the film aired jointly on XM Sirrius Satellite Radio. In this version, Klaus had the crap beat out of him by Howard Stern.